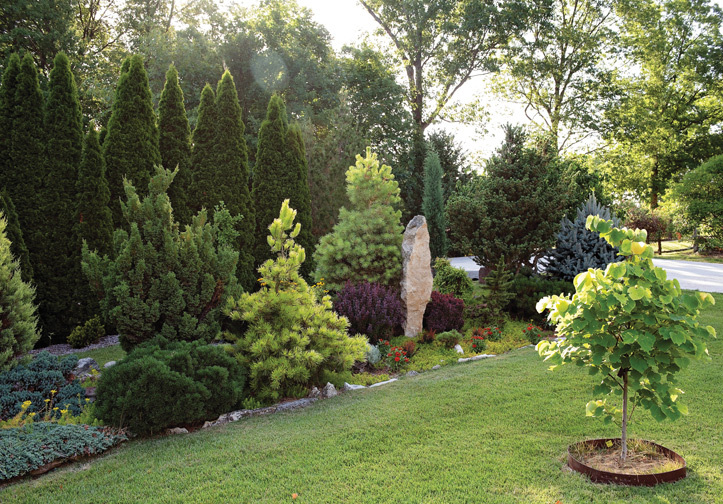 Kerry Wright’s Festus-area garden is teeming with comely conifers that provide green and other bursts of color year-round. The license plate on his Toyota Tacoma pickup reads “conifer.” That is really all you need to know. Confers are Kerry Wright’s gardening passion. 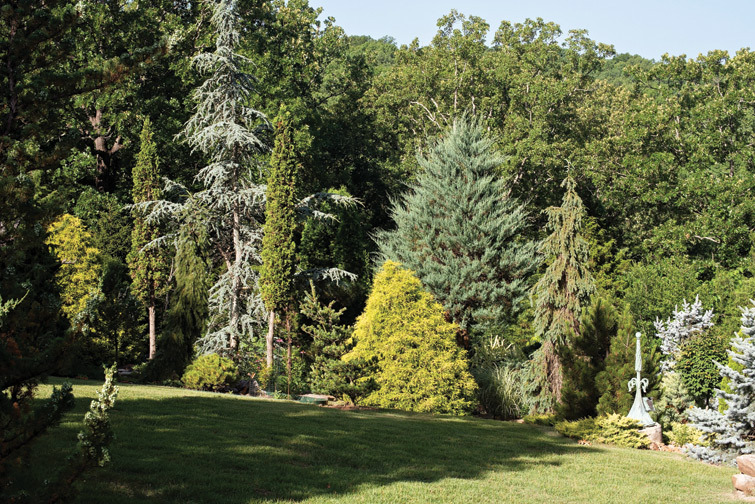 Simply described as “cone-bearing trees with evergreen needlelike or scalelike leaves,” Kerry’s spectacular, manicured one-acre garden near Festus is home to more than 500 varieties of conifers. They are beautifully woven into a lush textural tapestry incorporating sculpture, antique artifacts, stone pillars, perennials and annuals. The property includes a woodworking shed masquerading as a Tudor cottage and a potting shed disguised as a country chapel, complete with a stained-glass window. Both are testimonials to Kerry’s artistic talents. 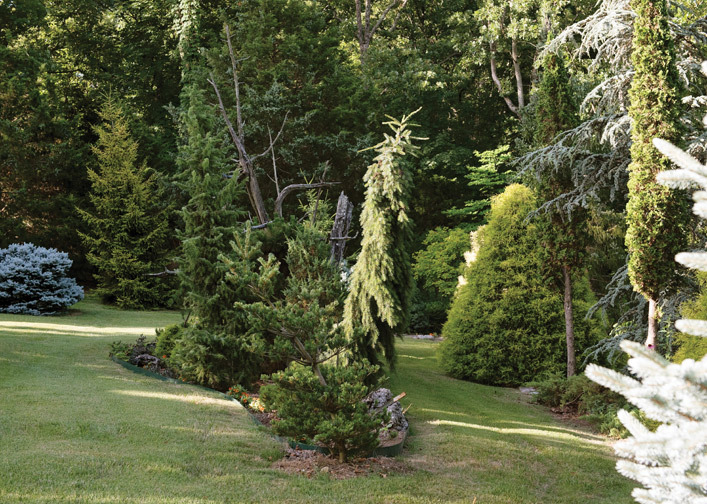 When you ask him, “Why conifers?” he gives an answer that is surprising to those uninitiated into the wonderful world of what most of us call evergreens. “It is,” Kerry says firmly, “for their winter color,” noting that when everything else is drab there are pines, spruces and arborvitaes that put on a brilliant show and fill his garden with color 12 months a year. Kerry’s love of plants began before he was out of high school, with jobs at local nurseries. He went on to work at Ritter Landscaping and Forrest Keeling Nursery before taking a job as the head gardener at Selma Farms near Festus, the corporate conference center owned by Union Pacific, where he specialized in ornamental plants. By necessity, Kerry started small. Most of the trees that now stand so gracefully began as tiny seedlings. “We were raising two kids and I didn’t have the money to spend on large plants,” he recalls. What Kerry did have was knowledge, gardening friends and a sense of color and design. One of the first trees he planted was a rare golden larch, a descendent of two exotic trees that came to St. Louis for the 1904 World’s Fair and stood outside the Chinese pavilion. 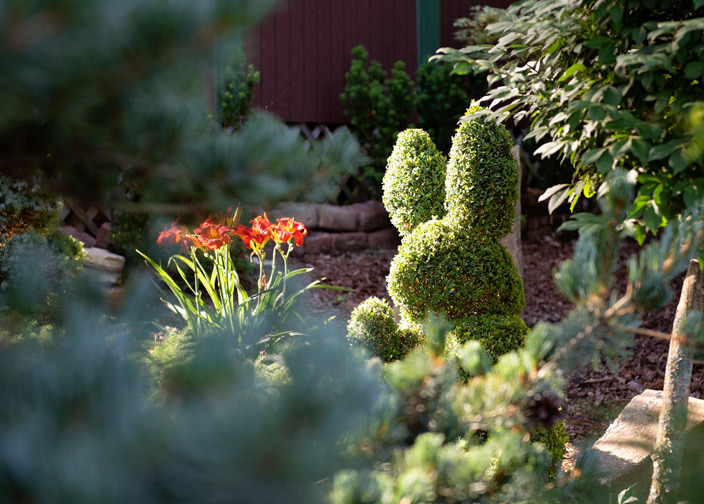 The tiny sprig he carefully nestled in his infant garden came to him by way of the Missouri Botanical Garden, where another relative of the original World’s Fair trees grows outside the Sachs Museum building. Visitors to either the botanical garden or Kerry’s garden can admire the soft green foliage in spring and summer that turns a brilliant gold in fall before dropping its needles. Kerry has a particular fascination for “witch’s brooms,” which are mutations that cause a number of shoots to grow from a single point, changing the growth pattern of a tree. In conifers, they can appear as a dwarf plant growing within a normal tree. Worldwide propagation of these witch’s brooms has led to the creation of a number of dwarf conifer cultivars. They have become a collection within Kerry’s larger collection, lovingly tended in separate garden areas of their own but also tucked in the borders of his larger assemblages. Working with close friend and conifer specialists Gary Gee of Gee Farms in Stockbridge, Michigan, the state’s largest retail nursery, he has become an expert at grafting unusual conifer species to hardier rootstock. A network of acquaintances that extends to Europe has introduced him to the most spectacular varieties that are hallmarks of his garden. Proper drainage is the key to growing conifers and most other plants, emphasizes Kerry, who recently began a garden consulting business. 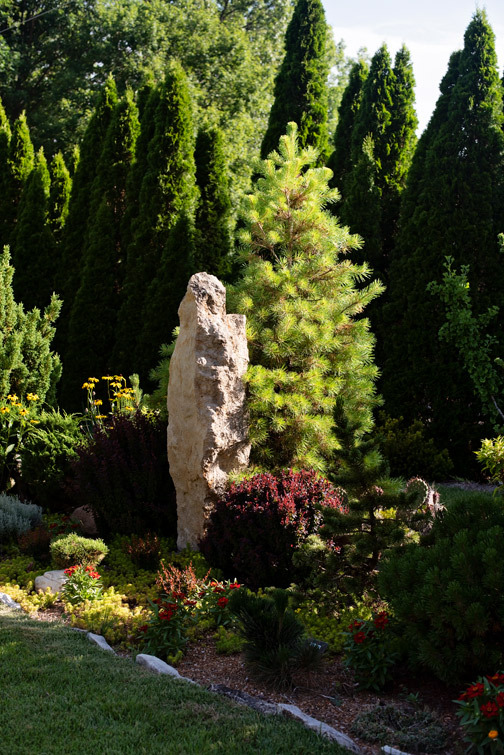 A stroll through his garden provides a small taste of the drama, beauty and color conifers can add to gardens large and small. Kerry talked about some of his favorite cultivars he would recommend to the home gardener. 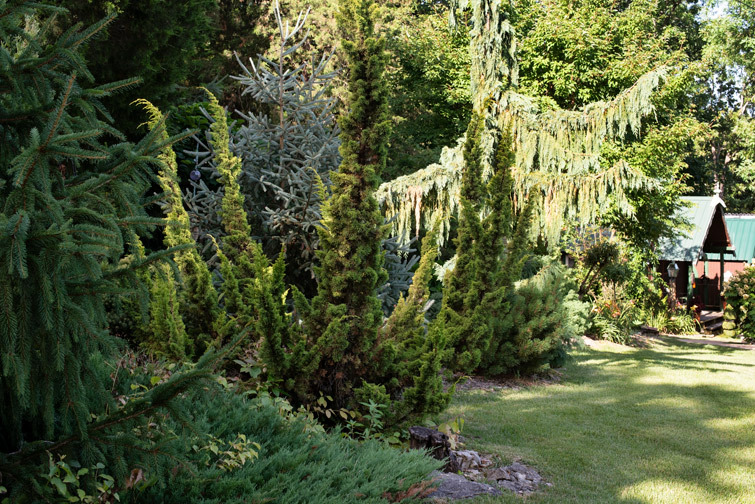 Japanese falsecypress ‘Tempelhof’: His wife Susan’s favorite bears whorls of needles that look almost flower-like. New growth is yellow-green, maturing to deep green with the foliage turning bronze in winter. For yellow color: ‘Vintage Gold’ and ‘Lemon Thread’ falsecypress. Both stay relatively small, topping out at around 7-8 feet. 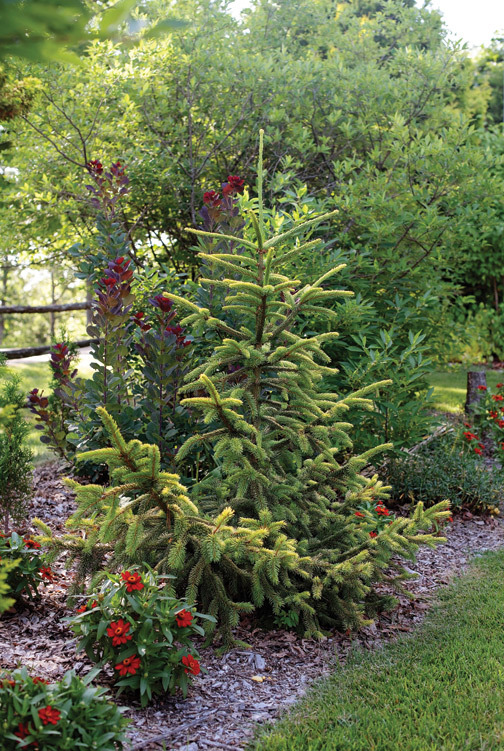 With Oriental spruce ‘Skylands,’ the exterior needles are bright yellow in full sun and the tree can grow to 35 feet but may need a bit of afternoon shade in hot, humid climates. ‘Wate’s Golden’ Virginia pine has a wind-swept look and turns “school bus yellow” in winter. For blue color: The spruce that is so beautiful and gray-blue in Colorado can be tricky to grow in stifling Midwest summers. 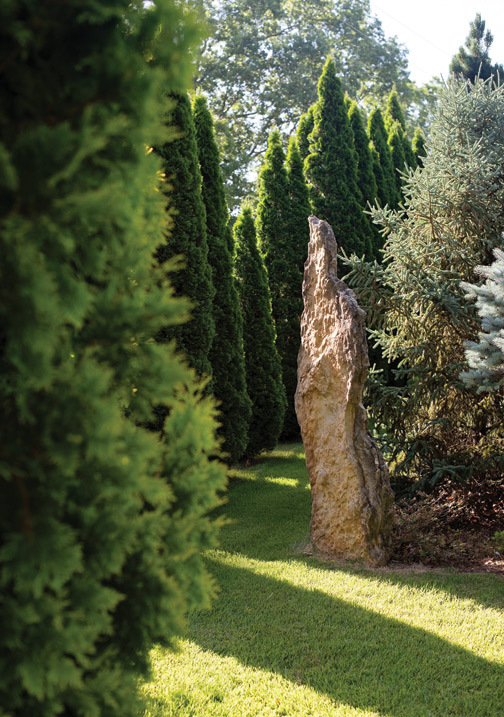 For the best results, Kerry recommends: blue spruce, which can grow into a stocky, 6-foot tree; ‘Egyptian Pyramid,’ which grows into a low triangular mound, and ‘Otto von Bismark,’ which grows to about 6 feet tall and 4 feet wide. All need full sun. ‘Rydal’ Norway spruce is a dwarf that was discovered as a witch’s broom in Sweden and sports new growth that is bright crimson. ‘Morgan’s’ arborvitae, native to Australia, only grows to about 3 feet tall but may be the champ when it comes to color changing. Lime green, yellow-tipped summer foliage turns purplish in fall and then bright orange when winter chill sets in. 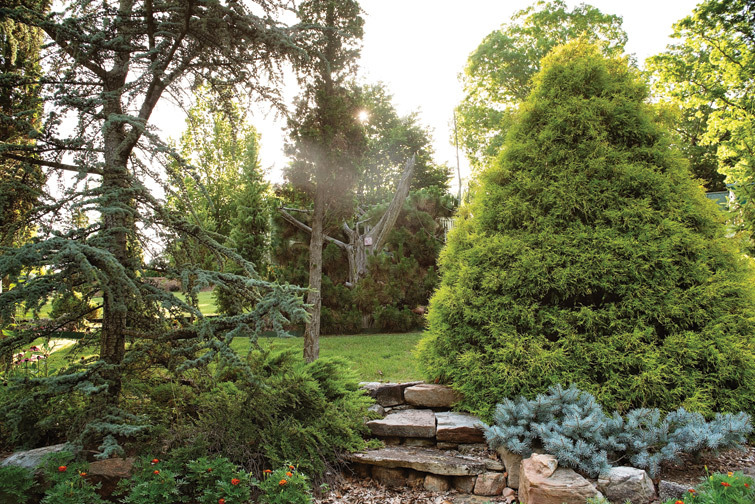 While conifers are his passion, Kerry continually emphasizes the joys of winter gardening, and he has additional recommendations regarding woody plants that add color to the landscape. One whole area of his garden is devoted to deciduous hollies or winterberries that sport berry clusters in red, yellow and orange, depending upon the cultivar. Massed together, they provide a neon display during the winter months. Coral-bark maples are small, often multi-trunked trees that put on a show even when they lose their leaves. 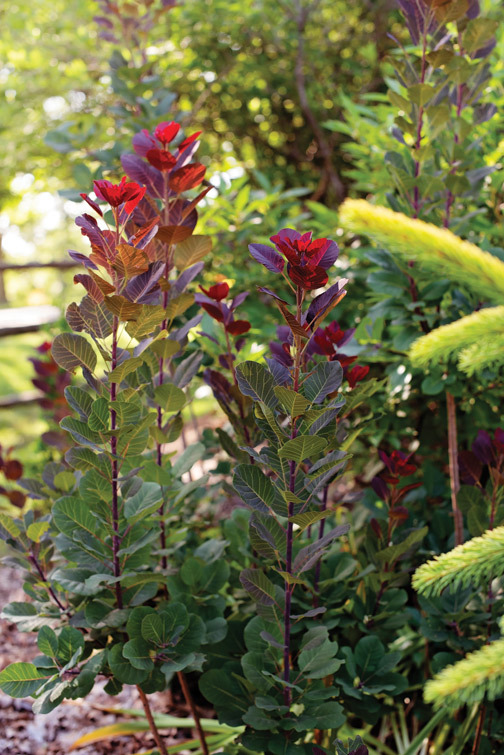 Bark color can go from orange to bright red and make them standouts in the winter garden. Kerry also recommends a new variety of shrub dogwood that takes the tried and true red twig dogwood a step further. ‘Midwinter Fire’ dogwood has stems that go from yellow to orange to bright red once the leaves are gone, making it truly live up to its name. Questions on growing conifers? Ask Kerry at gardenwrightsolution.com.